Last week I shared my recipe for Moroccan chicken with preserved lemons and olives, which made me think I should also share my recipe for homemade preserved lemons! They're incredibly easy to make, and last up to a year, so they're a great staple to have in the pantry. They also make a pretty awesome gift for any of your foodie friends. The traditional Middle Eastern method for making preserved lemons instructs you to score the lemons, cover the exposed flesh with salt, pack them into a jar, and top up with extra lemon juice from additional lemons if more liquid is needed to create a seal. My method, however, involves one extra step. I boil the lemons whole before scoring and salting them. In my experience, this extra step releases a lot of aroma and juice from the lemons, meaning you don't need to add extra lemon juice, while it also makes the rind very soft. Most recipes that use preserved lemons only ask for the rind, so ensuring that the rind is extra tender gives you a better result. I haven't added any aromatics to this recipe, but you certainly can if you like. Aromatics that work well include: black peppercorns, bay leaves, cinnamon sticks, cardamon pods, cumin seeds, dried chili, coriander seeds, and mustard seeds, to name a few. If you want to include aromatics, you can rub them into the lemons with the salt, or simply add them to the jar. When cooking with preserved lemons, I like to remove the seeds, and focus on primarily using the rind. Depending on the dish, and the saltiness of your preserved lemons, you may choose to rinse your preserved lemons to remove excess salt before cooking with them. Trim the stalk ends off the lemons, and wash to remove any impurities. Place the lemons in a pot and cover with water. Set on a high heat and boil for 5-10 minutes, until they're soft. Remove the lemons from the water, and allow to cool. Once the lemons are cool enough to handle, cut a cross in the top of the fruit so that it is almost cut into quarters, but remains attached at the bottom. Rub salt over the exposed flesh, making sure it's generously covered, and then reform the lemon back into its original shape. I use ½ - 1 tablespoon per lemon. Then pack the salted lemons tightly into a clean airtight jar, allowing the lemon juice to squeeze out and encase the fruit. 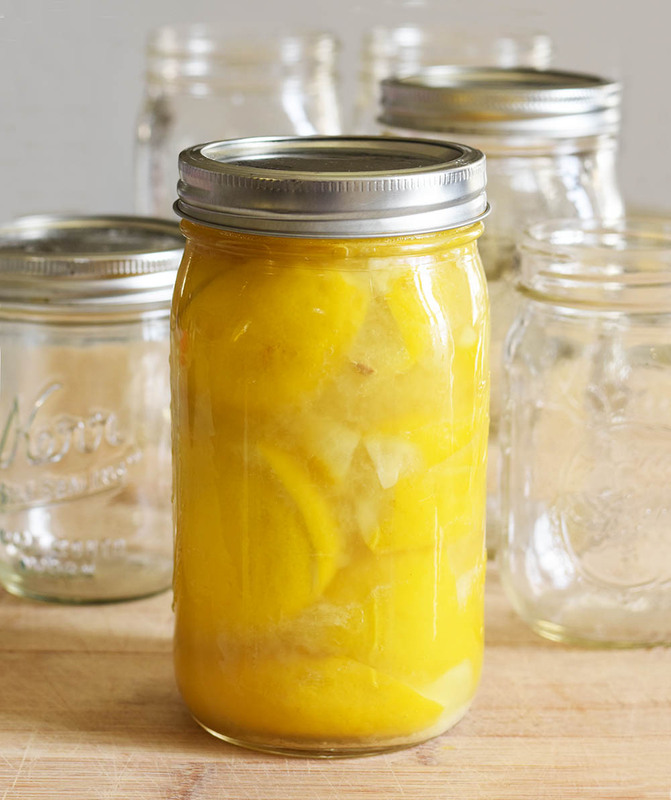 Make sure the lemons are completely covered in juice, then seal the jar, and store at room temperature for 1 month to allow the fruit to preserve. It's a good idea to rotate the jar occasionally to ensure the salt and liquid is well mixed and evenly distributed. Once opened, the lemons will keep for up to a year. P.S. You might also like this Moroccan-Spice Cauliflower Soup.